Last week, my fellow Geocoastal Research Group member (Rebecca Hamilton) and I (Stephanie Duce) spent the week at the Australian Nuclear Science and Technology Organisation’s (ANSTO) Institute for Environmental Research (IER) at Lucas Heights. While we were there, we used the high-tech lab facilities to prepare our core samples for radiocarbon dating using ANSTO’s Accelerator Mass Spectrometer. This process is very important for both of our PhD projects, as it will allow us to build a timeline for interpreting the environmental and climatic changes reconstructed from our respective core samples. The pre-treatment processes were complex and very different for my coral samples from reefs in the Great Barrier Reef and French Polynesia and Bec’s charcoal samples from Cambodian Lake sediments. We were thankful to have the knowledgeable Quan Hua (Principal Research Scientist at IER) teaching us what to do and checking every critical step along the way! We had to carefully choose the best possible part of our sample, clean it thoroughly to ensure that no pesky modern carbon (which is in everything living or that has ever lived) was present. For my corals, this meant countless rinses in ultrapure water, long hydrosonic baths and drying overnight in an oven. For Bec’s charcoal, this involved acid and base “digestions” – taking care not to lose too much of her tiny samples! We then had to carefully weigh our samples and extract the CO2. I used acid to dissolve my corals releasing the CO2. Bec used a 900°C furnace! We used liquid nitrogen (this was fun!) to freeze the CO2 gas allowing it to be transferred from tube to tube in preparation for graphitisation. 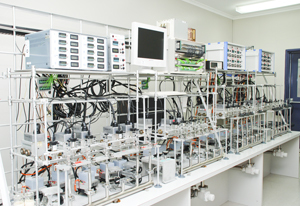 The ingenious Graphitisation machine (pictured) separated the oxygen from the carbon and created small pieces of graphite containing our sample’s carbon for measurement in the accelerator. Fingers crossed our little samples will produce accurate and interesting dates helping us to understand the history and evolution of our study sites!